There is a perception that in order to use a warping valet/trapeze you have to have a lot of room. I use one in large part because I have very little room. You can see in this photo that I have another loom in front of the Leclerc. There is - at best - three feet between the breast beam of the Leclerc and the other loom. There is just enough room that I can have my loom bench at the Leclerc and a narrow 'path' between the two looms. The other loom doesn't have a ceiling rod to use, so Doug made a 'trapeze' for me out of two 2.x4s and a closet dowel. 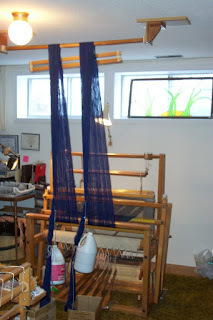 That loom has at most three feet between the breast beam and the wall in front of it. One of the things many people have difficulty with is getting their warps beamed 'well'. There are many different approaches to getting this part of the process done. Over the years I have found that beaming with tension is a key component of getting warps that behave. One recommendation for beaming is to stretch the warp out for as far as you can, then put weight onto the warp chain and drag it along the floor. When you have only three feet in front of the loom, the sections you can beam are very short. 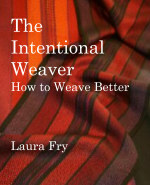 Weighting the warp as it hangs off the breast beam means even shorter sections. By routing the warp chain up and over a valet or trapeze, longer sections of warp can be groomed and then beamed. This makes for a better job (as far as I'm concerned) and it also makes the whole process more efficient. I have had so many people contact me to say using such a device - either ceiling mounted or the 2x4/closet dowel - have made weaving much more enjoyable as it no longer is a chore of hours. Here is a video I did of me beaming a 9 meter long place mat warp. Notice the clock. This clip was done all in one go and was not edited in any way. 9 meters. About 10 minutes.